By Jarrod Jones. She’s a whirling dervish decked out in diamonds and clubs, and she’ll clobber you one if you cross her. Of course you know Harley Quinn. She’s featured in cartoons, motion pictures, and has launched a tidal wave of merchandise with her cherubic mug, all of which can be found in virtually every corner of the globe. In the world of comic book fandom, Harley Quinn is everywhere. And her status as a premiere DC Universe icon has only grown in the twenty-five years since her inception as a gangster’s moll in Batman: The Animated Series. She’s changed quite a bit since then. Some would say for the better, considering that that “gangster” in question was none other than the odious Joker himself. Over time Quinn has since moved on from her destructive infatuation with the Clown Prince of Crime to become a formidable ne’er-do-well all her own. As a comic book character, Harley Quinn has experienced more change in a quarter century than some of DC’s icons have ever seen. Quinn’s profile has shifted considerably over time, from henchwoman to anti-hero to kids’ cartoon star and back. Yet the essence of Harley Quinn remains, and there’s been a small army of incredible artists that have captured some of her finest (and not so finest) moments in wonderful pieces of art along the way. 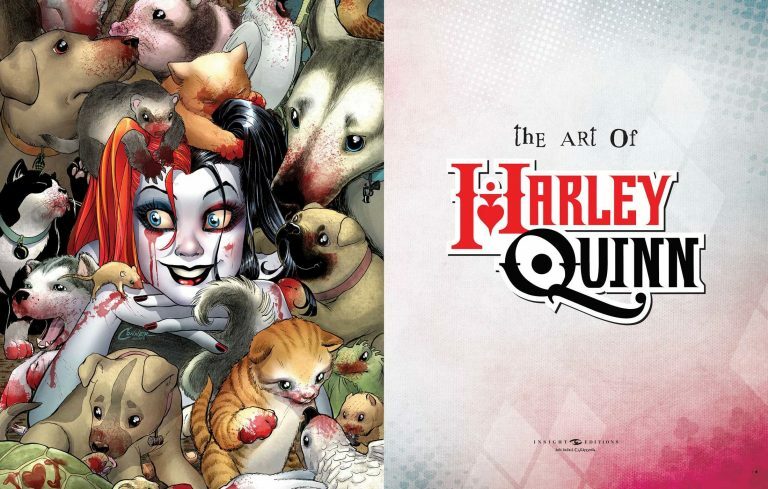 Farago’s The Art of Harley Quinn is here to provide an entertaining glimpse at the character’s second life in the comic book medium, where she’s had a chance to truly flourish. It’s been an interesting ride for Farago, who spent months researching the character on his journey to find the art that would fill his book. 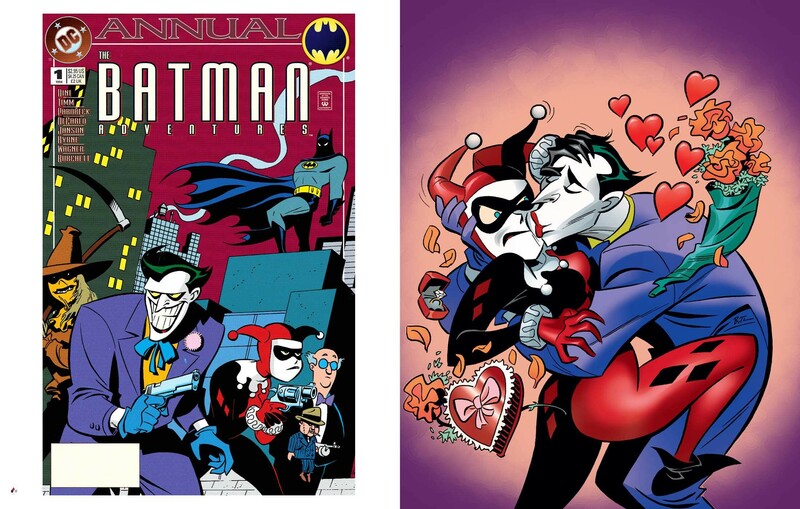 Just in time for the holidays, Insight Comics has released The Art of Harley Quinn for avid fans of Quinn and lovely comic art alike. And to mark this exciting release, I spoke with Mr. Farago about his book, the comics creators he interviewed to flesh it out, and his favorite Quinn-centric episode of Batman: The Animated Series. 1. She has been a part of the Bat-mythos for twenty-five years but it feels like she’s been there since the very beginning. What makes Harley Quinn feel so timeless? Paul Dini was writing an early episode of Batman: The Animated Series when he hit upon the now-obvious question, “What if the Joker had a sidekick?” Robin shares Batman’s outlook on crimefighting, so what kind of person would side with The Joker? Dini thought there were even better storytelling opportunities if the sidekick was female and could serve as love interest while also adding another female character to the mostly-male Batman cast, and Bruce Timm came up with a brilliant, iconic design. Really enduring characters have a strong, core concept that can be summed up pretty easily. Superman’s got powers and he helps people. Batman has a bat-costume and he’s a detective. Harley’s a psychiatrist turned criminal, or The Joker’s (ex-) girlfriend. A strong concept paired with a great costume can get you pretty far in comics. 2. 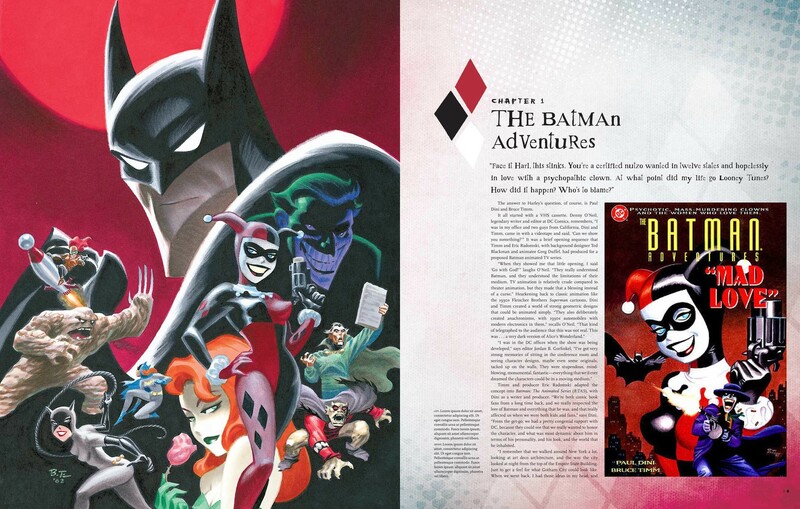 What was the genesis point of ‘The Art of Harley Quinn’? Was this you being proactive about the character’s 25th anniversary? Because you must have conducted at least 50 interviews for this book. The coordination had to have been intense. I try to have at least a couple of books in the works at any given time, and I mentioned to one of my editors at Insight Editions that I had a gap in my schedule, and that it would be fun to do something with a DC Comics character, since I knew Insight had a good relationship with Warner Bros. About a month after that conversation, at Comic-Con 2016, they asked me to pitch a Harley Quinn book, and over the next three months, I read just about every Harley Quinn comic book appearance ever published, interviewed everyone I could, and selected artwork for the book. I had to turn around the first draft of the manuscript very quickly after that, but that’s how I always write. Front-load on the research and the interviews, then take a few days off my day job so I can piece it all together into a (hopefully) interesting and coherent narrative. The interviews were a lot of fun, and they ranged from ridiculously brief email exchanges with artists who were dealing with their own deadlines to hourlong phone calls with Dini, Timm, and Denny O’Neil. (I still can’t believe I got to talk about Batman comics with Denny O’Neil!) I also got to hang out with the brilliant artist and storyteller Ronnie del Carmen at Pixar for an afternoon, which was the only face-to-face interview I got to conduct for the book. Thanks to the internet, though, I could get the ball rolling on dozens of interviews at once, conducting some entirely through email, figuring out when I could schedule phone calls with key creators like Karl Kesel and Terry Dodson… a flexible work schedule and persistence really paid off. 3. To focus entirely on the visual comics history of Quinn as a comic book character — as opposed to an animation icon — is an inspired approach. I don’t think anything on this level exists for comics fans, with the insights provided by the creators who were there as Harley evolved into what she is today. How does it feel to have contributed an essential tome to such a beloved character? Although I touched upon Harley’s origins as an animated cartoon, the video games that reinvented the character around 2010, and Margot Robbie’s live-action Harley in the Suicide Squad movie, DC insisted that we keep the focus on the comics, and there was more than enough material to do that. Her earliest comic book appearances were all based on Batman: The Animated Series, which I watched religiously at 4:30 every afternoon, and it was a lot of fun revisiting that era with Dini, Timm, and comic book creators like Kelley Puckett, Rick Burchett, and Ty Templeton. Getting the opportunity to tell their stories, and to hear their stories about the late, great Batman artist Mike Parobeck, that’s an amazing feeling. I’m really looking forward to my 2018 convention schedule, when I’ll be able to sign books and talk to all the Harley Quinn fans and cosplayers who’ve made the character what she is today. 4. You’re the curator the Cartoon Art Museum in San Francisco, which means you’ve got to work with some pretty astounding pieces of artwork in your time. How did you decide to lay out this book — and how did you decide which pieces made the grade? I read hundreds of comics featuring Harley while researching this book, everything from her solo books to cameo appearances where she popped into a story for only a page or two. Selecting art for the book was very much like curating a Cartoon Art Museum exhibition. While I could have filled a book with nothing but cover art by Amanda Conner, Bruce Timm, and Terry and Rachel Dodson, that would have been a disservice to all of the other artists who’ve drawn her over the past 25 years. I also had to deal with the fact that Harley’s appeared in more comics in the past five years than she did in the previous twenty, so I had to make a lot of difficult decisions in the art selection for the final chapters of the book. Harley herself is a chaotic mix of humor, violence, cheesecake, and drama, and I wanted to make sure the art selection reflected that. 5. In putting the Quinn timeline together, how did you go about digging up all these comics? Did you end up re-reading entire arcs just for the heck of it? It was much easier to tackle a project like this today than it would have been ten or maybe even five years ago. I’ve always been a collector, so I already had a lot of these comics at home, including Harley’s first comic book appearance in the Batman: The Animated Series-inspired comic, Batman Adventures. Anything I didn’t have, I borrowed from friends or tracked down as trade paperbacks through our local library and their extensive inter-library loan program, and I bought a lot of trades and then-recent back issues at my local comic shop, Fantastic Comics in Berkeley. Although it’s possible I missed a few oddball guest appearances here and there, I think I managed to read pretty much everything. I had to read at a pretty fast clip to get my research done in time, but I did really take my time when it came to Batman Adventures and Harley’s first solo series by Karl Kesel and Terry and Rachel Dodson. 6. Your book brought the noirish “Vengeance Unlimited” storyline back into my life in a profound way. (The A.J. Lieberman-scripted run in ‘Harley Quinn’ Vol. 1, issues #26-38.) During this run we saw a darker version of the character, in a grittier, ‘Gotham Central’ type of story. Do you think the overall response on this take ultimately led to the Harley Quinn we see today in the Amanda Conner/Jimmy Palmiotti series? As great as that Kesel-Dodson run was, it wasn’t burning up the sales charts the way it should have, and DC had to choose between canceling the book or shaking up the creative team. Editor Matt Idelson decided that if he was going to make a change, he might as well make it a big one, so he turned the book over to A.J. Lieberman, who’d written some well-received TV shows, but had never written a comic book before. Artists Mike Huddleston and Troy Nixey were the polar opposite of the Dodsons, too. It was a very polarizing move, like if Friends just suddenly decided it should be 500% more like The Sopranos for the second half of its final season. The move generated some talk and some renewed interest in the character, but sales didn’t improve and the new direction lasted about a year altogether. 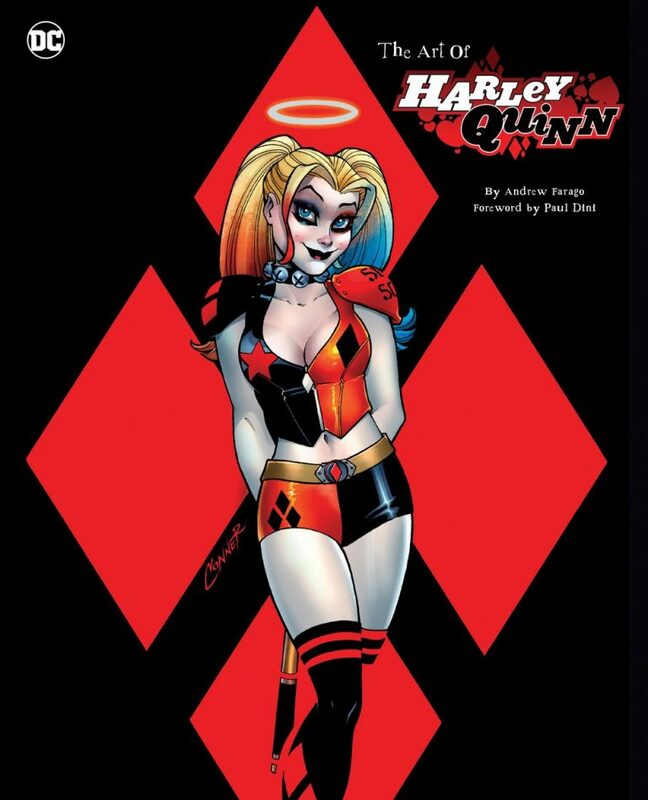 DC used Harley very sparingly for a while after her book got canceled, and that’s pretty understandable, since no supervillain (or sorta- supervillain) had ever been able to carry a series for much time at all, so they most likely wanted to give her some downtime after three years’ worth of monthly comics. Paul Dini wrote most of her appearances for the next several years after the Lieberman/Huddleston/Nixey run, going with a back-to-basics approach, and fans embraced her all over again. I couldn’t say for sure whether Jimmy and Amanda drew inspiration from Lieberman’s issues, but his version wouldn’t be completely out of place next to theirs. 7. In your book you tackle all the various incarnations of Quinn as she’s appeared in DC Comics. Were there ever versions you felt were a bridge too far for the character? Although I said earlier that Harley’s easy to describe, she’s got so many layers that writers can take her in almost any direction and still make it work and have it be true to the character. She’s got anger management issues, but she’s a trained psychiatrist. She had a relatively normal upbringing, but she spent years of her life committing felonies alongside one of the most dangerous criminals in the entire world. She’s been (more or less) a crimefighter for the past few years, but all of her best friends are supervillains. Personally speaking, I’m not as invested in the darkest versions of Harley, like we see in the “Arkham” video games, but they still ring true, and without that version of the character, it’s possible we don’t get her headlining the Suicide Squad comic in 2011, or starring in a movie in 2016, or starring in a deluxe hardcover art book in 2017. 8. On that tack, which iteration of Harley Quinn works best within the comics format for you, and why? The original version will probably always be my favorite, since I was such a big fan of her on Batman: The Animated Series (voice actress Arleen Sorkin deserves a ton of credit for bringing her to life in the 1990s), but Amanda Conner’s such a phenomenal artist that the current roller derby/Daddy’s Little Monster version is an incredibly close second for me. It’s a really sharp contrast between the two versions, but I love ’em both. I had two other books hit stores within a few weeks of The Art of Harley Quinn, with The Complete Peanuts Family Album published a week before Harley, and Totally Awesome: The Greatest Cartoons of the Eighties in stores at the end of November. The sane thing to do would be to kick back and enjoy that, plus the fact that my co-workers and I just reopened the Cartoon Art Museum in late October, but I’ve actually already started up on a follow-up to Totally Awesome, which is a complete history of Voltron, currently scheduled for a 2019 release. I also just wrapped up a book called The Zombie Gnome Defense Guide, co-written with my wife, cartoonist Shaenon K. Garrity, and that should be in stores in spring 2018. In between all that, I’m raising a toddler, putting together exhibitions for the Cartoon Art Museum, and whenever you’re reading this, it’s a safe bet I’m reading comics or watching cartoons. It never ends. 10. Favorite Harley Quinn-centric episode of ‘Batman: The Animated Series’, please. Although “Mad Love” feels like a no-brainer, I’ll always think of that as a comic book first, and a cartoon second. I’ll pick “Harley’s Holiday” for this one, since it’s got a hilarious script by Paul Dini, brilliant direction by Kevin Altieri, and it’s a really fun and unlikely team-up between Batman and Harley. It’s the first time that we got to see Harley as a character independent of The Joker, and it’s safe to say that Paul Dini made the right call taking her in that direction. ‘The Art of Harley Quinn’ is available now. You can purchase it through Amazon here.